The Book of Ezra is a book of the Hebrew Bible and the Christian Old Testament. It is a record of events occurring at the close of the Babylonian captivity. In describing the initial stages of the rebuilding of the Temple of Jerusalem and Ezra's establishment of strict traditions of religious and racial purity, the book recounts the historic beginnings of Judaism—as distinguished from the ancient Israelite religion which preceded it. Ezra the Scribe is the traditional author of this book and some modern scholars agree that he may have been the writer of at least part of it. The history of the first return of exiles, in the first year of Cyrus the Great (536 B.C.E. ), till the completion and dedication of the new temple, in the sixth year of Darius (515 B.C.E. ), chapters one to six. The history of the second return under Ezra, in the seventh year of Artaxerxes Longimanus, and of the events that took place at Jerusalem after Ezra's arrival there (seven to ten). The book contains purported copies of several historical documents and other memorabilia connected with the history of the Jews, including the supposed decree of Cyrus (536 B.C.E.) allowing the Jews to return to Jerusalem, lists of leading returnees, letters to and from Persian governors, and the declaration of Ezra requiring all Jews who had married foreign wives to divorce them (456 B.C.E.). It also gives information on an attempt by the people later known as the Samaritans to assist the Jews in rebuilding the Temple of Jerusalem, as well as their actions to hinder its progress when they were rebuffed. In the Hebrew Bible, the Book of Nehemiah and the Book of Ezra are counted as one volume. The two are still distinguished in the Catholic Vulgate version as I and II Esdras. Ch. 1: Cyrus the Great of Persia, inspired by God, permits the Israelites to return to Jerusalem and rebuild its temple. He returns to them the golden vessels which had been carried off by Nebuchadnezzar. Ch. 2: A detailed list of returnees is provided, together with their possessions and wealth. The number of the captives who return from Babylon to Palestine with the governor Zerubbabel is stated as 42,360, besides 7,337 male and female slaves and 200 singers. Ch. 3: The returnees assemble in Jerusalem. Zerubbabel and the priest Jeshua ben Jozadak supervise in building the altar. Sacrifices are offered and the Feast of Tabernacles is celebrated. In the second year the foundations of the temple are laid, and the dedication takes place with great rejoicing. Persian officials put a stop to the rebuilding of the temple after a complaint is lodged against its builders. Ch. 4: People already living in the land, possibly including some northern Israelites as well as mixed-race people near Jerusalem, offer to help the returning Jews build the temple. 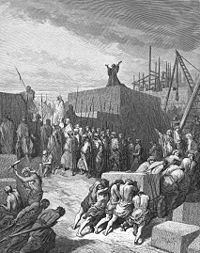 Zerubbabel and the other leaders harshly rebuff them, invoking Cyrus' decree and declaring: "You have no part with us in building a temple to our God." The insulted local inhabitants then attempt to frustrate the work. Later, after Cyrus' death, they lodge various complaints with Persian officials which succeed in procuring a prohibition against further construction of the temple. The work is interrupted untill the second year of Darius. Ch. 5: Through the exhortations of the prophets Haggai and Zechariah, Zerubbabel and Jeshua ben Jozadak recommence the building of the temple. Tatnai, the Persian governor west of the Euphrates, sends a report of these actions to Darius, a purported copy of which is preserved in the text. It recommends that a search be made in the royal archives to confirm Cyrus' supposed decree regarding the Temple of Jerusalem. Ch. 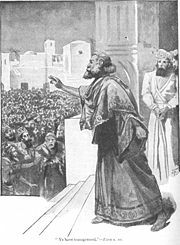 6: Darius confirms the decree of Cyrus authorizing the rebuilding of the temple and directs Tatnai not to disturb the Jews in their work. He also exempts them from tribute and supplies them with everything necessary for their offerings. The temple is finished in the month of Adar, in the sixth year of Darius, and is dedicated in a ceremony involving the sacrifice of hundreds of animals. Later, the Passover feast is celebrated with great joy. Ch. 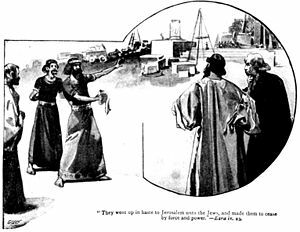 7: Artaxerxes appoints Ezra to lead a new wave of returnees and to bring with him to the temple artifacts which still remain in Babylon. Ezra is described as "a teacher well versed in the Law of Moses." He is authorized by Ataxerxes to "appoint magistrates and judges to administer justice to all the people of Trans-Euphrates" of the Jewish faith. As God's agent—and the king's—he is empowered to punish those who disobey with "death, banishment, confiscation of property, or imprisonment." Ch. 8: A list is provided of the heads of families who returned with Ezra to Palestine. Ezra, writing in the first person, describes how he led his caravan safely to its destination and delivered the sacred vessels to the temple. Ezra decrees that all Jews must divorce their wives if the women are not Israelites. Ch. 9: Certain Jewish leaders inform Ezra that many Jews—including other officials, priests, and Levites—have married non-Israelite women. Ezra, who follows a strict interpretation of the Law of Moses banning intermarriage and friendship with non-Israelites, is appalled at this, tears his clothes and beard, and prays at length to God. Ch. 10: A crowd gathers in support of Ezra. He issues a proclamation calling the returnees to assemble in Jerusalem. Ezra decrees that all who have taken foreign wives are compelled to divorce them. Opposing him are Jonathan son of Asahel, Jahzeiah son of Tikvah, Meshullam, and Shabbethai the Levite. The rest of the leaders agree to enforce the decree, and the book closes with a list of prominent men who had married non-Israelite women, including some who also had children by these wives. an account of the return of the exiles, and a brief survey of the fortunes of the Jewish community down to the reign of Xerxes. extracts from a collection of historical documents in Aramaic, illustrating the fortunes of the community in the reigns of Artaxerxes I, and Darius, with a short appendix in Hebrew. a record of the enterprise of the purported author of the book, including a copy of the decree granted to him by Artaxerxes II, with an account of the author's work at Jerusalem. The authenticity of the documents is a matter on which there is a difference of opinion, critics being disposed to regard most or all of them as inauthentic, whereas before the nineteenth century they were generally thought to be genuine. The Cyrus cylinder confirms that Cyrus the Great allowed various exiles to return and restore their local temples. While the historicity of Ezra's account is thus somewhat confirmed, there is a profound irony in the above quote from Cyrus, in that he presents Marduk as the deity who inspires him. Marduk was the eastern name of Baal, or at least a deity very similar to Baal, whom the Jews viewed as Yahweh's mortal enemy. The third part of the book appears to be a personal memoir. It is regarded by some critical scholars, as well as virtually all traditionalists, as authentic. Many critics hold that the original order of Ezra and Nehemiah may in fact be reversed. In any case the priest Ezra has less authority in Nehemiah—in which Ezra is the high priest but not the direct agent of Ataxerxes with civil as well as religious authority. The Books of Chronicles, Ezra, and Nehemiah may once have been a single work. Critical scholars tend to dismiss the idea of Ezra as the work's author, because internal evidence suggests that the writer—or at least the final redactor—lived well after Ezra's time. In recounting the return of the exiles, the rejection of aid from the people of the land who had not gone into exile, the rebuilding of the Temple of Jerusalem, and the putting away of foreign wives, the Book of Ezra marks the beginning of the religion of Judaism. Prior to this, the Hebrew Bible tells the story of the Israelites, the kingdoms of Judah and Israel, and the Babylonian exile. In these stories, the Israelites often reject God's message; the apostate northern Kingdom of Israel is destroyed by the Assyrians, while the often faithless southern Kingdom of Judah is overcome by the Babylonians, its temple destroyed, and its leading citizens taken into exile. In Babylon, many of the exiles from Judah united around the leadership of the priests of Jerusalem and prophets such as Ezekiel and Deutero-Isaiah in the hope of returning, rebuilding the temple, and receiving the Messiah—a king of the line of David. Finally, under Cyrus, two out of three of these hopes were to be fulfilled. Those who returned under Zerubbabel and later under Ezra represented a large part of the religious leadership and political elite who most faithfully adhered to the teachings of the scriptures—at least those which had been written by this point—and the prophets. The offer of help from the people of the land to rebuild the Temple of Jerusalem—rejected out of hand by Zerubbabel and his fellow Jews—begins the Jewish tradition of absolute separation from the people later known as the Samaritans. These people worshiped Yahweh, like the Jews, but were considered suspect for several reasons. Some were northern Israelites who had intermarried with Assyrian colonists. The northerners were also suspect on account of their lack of loyalty to Jerusalem during the days of the divided kingdoms, including their support of the shrines at Bethel and Dan, which the southerners considered unauthorized by God and even idolatrous. Other "people of the land" were southerners who had avoided exile and did not share the Jewish experience in Babylon. Few of them would have been priests, Levites, or nobility, in contrast to those who had been removed to Babylon and allowed by the Persians to return and recolonize the land. After the failure of Zerubbabel—a Davidic descendant hailed by the prophets Haggai (2:23) and Zechariah (4:7-8) as a possible Messiah—to rebuild the temple, Ezra's arrival and success in this endeavor began the Second Temple period of Jewish history, which continued until the temple was finally destroyed by the Romans after the Jewish Revolt in 70 C.E. History of "Ezra, Book of"
This page was last modified on 8 August 2017, at 15:54.